Open access, just like dark chocolate and blueberries, is good and good for you, enabling information to be mined and reused, fostering the exchange of ideas, and ensuring public access to research that taxpayers often helped to fund. Moreover, as Dan Cohen contends, scholars benefit from open access to their work, since their own visibility increases: “In a world where we have instantaneous access to billions of documents online, why would you want the precious article or book you spent so much time on to exist only on paper, or behind a pay wall? This is a sure path to invisibility in the digital age.” Thus some scholars are embracing social scholarship, which promotes openness, collaboration, and sharing research. This year saw some positive developments in open access and scholarly communications, such as the implementation of the NIH mandate, Harvard’s Faculty of Arts & Science’s decision to go open access (followed by Harvard Law), and the launch of the Open Humanities Press. But there were also some worrisome developments (the Conyers Bill’s attempt to rescind the NIH mandate, EndNote’s lawsuit against Zotero) and some confusing ones (the Google Books settlement). In the second part of my summary on the year in digital humanities, I’ll look broadly at the scholarly communication landscape, discussing open access to educational materials, new publication models, the Google Books settlement, and cultural obstacles to digital publication. Central within a year of its publication. Since the mandate was implemented, almost 3000 new biomedical manuscripts have been deposited into PubMed Central each month. Now John Conyers has put forward a bill that would rescind the NIH mandate and prohibit other federal agencies from implementing similar policies. This bill would deny the public access to research that it funded and choke innovation and scientific discovery. According to Elias Zerhouni, former director of the NIH, there is no evidence that the mandate harms publishers; rather, it maximizes the public’s “return on its investment” in funding scientific research. If you support public access to research, contact your representative and express your opposition to this bill before February 28. The Alliance for Taxpayer Access offers a useful summary of key issues as well as a letter template at http://www.taxpayeraccess.org/action/HR801-09-0211.html. Why has the humanities been lagging behind the sciences in adopting open access? Gary Hall points to several ways in which the sciences differ from the humanities, including science’s greater funding for “author pays” open access and emphasis on disseminating information rapidly, as well as humanities’ “negative perception of the digital medium.” But Hall is challenging that perception by helping to launch the Open Humanities Press (OHP) and publishing “Digitize This Book.” Billing itself as “an international open access publishing collective in critical and cultural theory,” OHP selects journals for inclusion in the collective based upon their adherence to publication standards, open access standards, design standards, technical standards, and editorial best practices. Prominent scholars such as Jonathan Culler, Stephen Greenblatt, and Jerome McGann have signed on as board members of the Open Humanities Press, giving it more prestige and academic credibility. 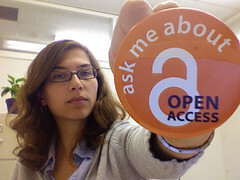 In a talk at UC Irvine last spring, OHP co-founder Sigi Jӧttkandt refuted the assumption that open access means “a sort of open free-for-all of publishing” rather than high-quality, peer-reviewed scholarship. Jӧttkandt argued that open access should be fundamental to the digital humanities: “as long as the primary and secondary materials that these tools operate on remain locked away in walled gardens, the Digital Humanities will fail to fulfill the real promise of innovation contained in the digital medium.” It’s worth noting that many digital humanities resources are available as open access, including Digital Humanities Quarterly, the Rossetti Archive, and projects developed by CHNM; many others may not be explicitly open access, but they make information available for free. In “ANTHROPOLOGY OF/IN CIRCULATION: The Future of Open Access and Scholarly Societies,” Christopher Kelty, Michael M. J. Fischer, Alex “Rex” Golub, Jason Baird Jackson, Kimberly Christen, and Michael F. Brown engage in a wide-ranging discussion of open access in anthropology, prompted in part by the American Anthropological Association’s decision to move its publishing activities to Wiley Blackwell. This rich conversation explores different models for open access, the role of scholarly societies in publishing, building community around research problems, reusing and remixing scholarly content, the economics of publishing, the connection between scholarly reputation and readers’ access to publications, how to make content accessible to source communities, and much more. As Kelty argues, “The future of innovative scholarship is not only in the AAA (American Anthropological Association) and its journals, but in the structures we build that allow our research to circulate and interact in ways it never could before.” Kelty (who, alas, was lured away from Rice by UCLA) is exploring how to make scholarship more open and interactive. You can buy a print copy of Two Bits, his new book on the free software movement published by Duke UP; read (for free) a PDF version of the book; comment on the CommentPress version; or download and remix the HTML. Reporting on Two Bits at Six Months, Kelty observed, “Duke is making as little or as much money on the book as they do on others of its ilk, and yet I am getting much more from it being open access than I might otherwise.” The project has made Kelty more visible as a scholar, leading to more media attention, invitations to give lectures and submit papers, etc. These categories provide a sort of abbreviated field manual to identifying different types of new model publications. I might add a few more categories, such as collaborative commentary or peer-to-peer review (exemplified by projects that use CommentPress); scholarly wikis like OpenWetWare that enable open sharing of scholarly information; and research portals like NINES (which perhaps would be considered a “hub”). The report offers fascinating examples of innovative publications, such as ejournals that publish articles as they are ready rather on a set schedule and a video journal that documents experimental methods in biology. Since only a few examples of new model publications could fit into this brief report, ARL is making available brief descriptions of 206 resources that it considered to be “original and scholarly works” via a publicly accessible database. My favorite example of a new model publication: eBird, a project initiated by the Cornell Lab of Ornithology and the Audobon Society that enlists amateur and professional bird watchers to collect bird observation data. Scientists then use this data to understand the “distribution and abundance” of birds. Initially eBird ran into difficulty getting birders to participate, so they developed tools that allowed birders to get credit and feel part of a community, to “manage and maintain their lists online, to compare their observations with others’ observations.” I love the motto and mission of eBird—“Notice nature.” I wonder if a similar collaborative research site could be set up for, say, the performing arts (ePerformances.org? ), where audience members would document arts and humanities in the wild–plays, ballets, performance art, poetry readings, etc. The ARL/Ithaka report also highlights some of the challenges faced by these new model publications, such as the conservatism of academic culture, the difficulty of getting scholars to participate in online forums, and finding ways to fund and sustain publications. In Interim Report: Assessing the Future Landscape of Scholarly Communication, Diane Harley and her colleagues at the University of California Berkeley delve into some of these challenges. Harley finds that although some scholars are interested in publishing their research as interactive multimedia, “(1) new forms must be perceived as having undergone rigorous peer review, (2) few untenured scholars are presenting such publications as part of their tenure cases, and (3) the mechanisms for evaluating new genres (e.g., nonlinear narratives and multimedia publications) may be prohibitive for reviewers in terms of time and inclination.” Humanities researchers are typically less concerned with the speed of publication than scientists and social scientists, but they do complain about journals’ unwillingness to include many high quality images and would like to link from their arguments to supporting primary source material. However, faculty are not aware of any easy-to-use tools or support that would enable them to author multimedia works and are therefore less likely to experiment with new forms. Scholars in all fields included in the study do share their research with other scholars, typically through emails and other forms of personal communication, but many regard blogs as “a waste of time because they are not peer reviewed.” Similarly, Ithaka’s 2006 Studies of Key Stakeholders in the Digital Transformation in Higher Education (published in 2008) found that “faculty decisions about where and how to publish the results of their research are principally based on the visibility within their field of a particular option,” not open access. Next up in the series on digital humanities in 2008: my attempt to summarize recent developments in research. This entry was posted in digital humanities, digital scholarship, open access. Bookmark the permalink. Wonderful as always, Lisa! Thanks for putting these posts together. Lisa, I’d like to take this opportunity to clarify the class action settlement process, something that many laypeople (and other legal professionals!) find very confusing. 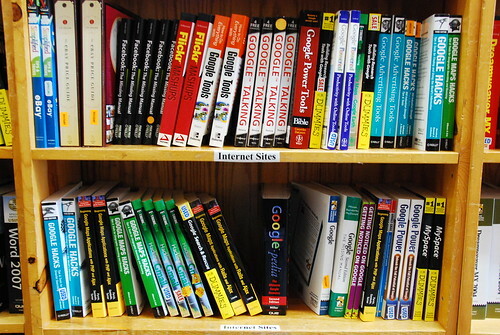 At the moment, there is a settlement on the table that the lawyers representing the Authors, Publishers, and Google have all worked very hard to negotiate. But, it by no means finalized. If you read the notice at Google Books Settlement you will see that first there has to be a hearing before the Judge decides whether or not to finalize the settlement. Anyone affected by the settlement has three options, one of which is to “Object.” Objections are taken very seriously by the attorneys involved as well as the Judge, because the more objections there are, the more likely the settlement will be dismantled. If you feel like fair use principles have been left out of the settlement, and you or anyone reading this blog are class members, by all means write a letter and file an objection. The letter must be postmarked by May 5, 2009, and follow the rules set out in the notice. Lisa: thanks so much for this blog — I will be quoting it in a report we are submitting to the MLA about the Google settlement and other matters.